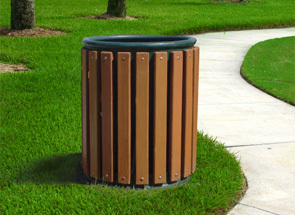 The wood slats of these 34 gallon trash receptacles provide a warm, natural look that blends beautifully with the landscape. Match your choice of Cedar or Pau Lopé wood slats with the variety of gloss or textured polyester powder-coat finish color options for the all steel constructed frame. Additional Accessories offered include: Powder-Coated Steel Flat Top Lids and Plastic Dome Top Lids as well as both In-ground and Surface Pedestal Mounting Kits. These steel trash cans are available with several versatile options designed to suit your needs. To make your ordering process simple please follow the easy 3 step ordering process. and Choose receptacle frame color. 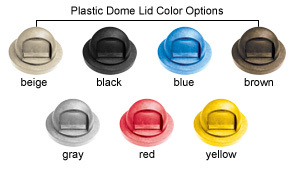 Select Model (C, D, E, F, G or H) and Choose lid color. (I) Enter the Quantity of the complete wood slat trash receptacle(s) you would like to order.